This was a strong, new box when we mailed it from Chicago. 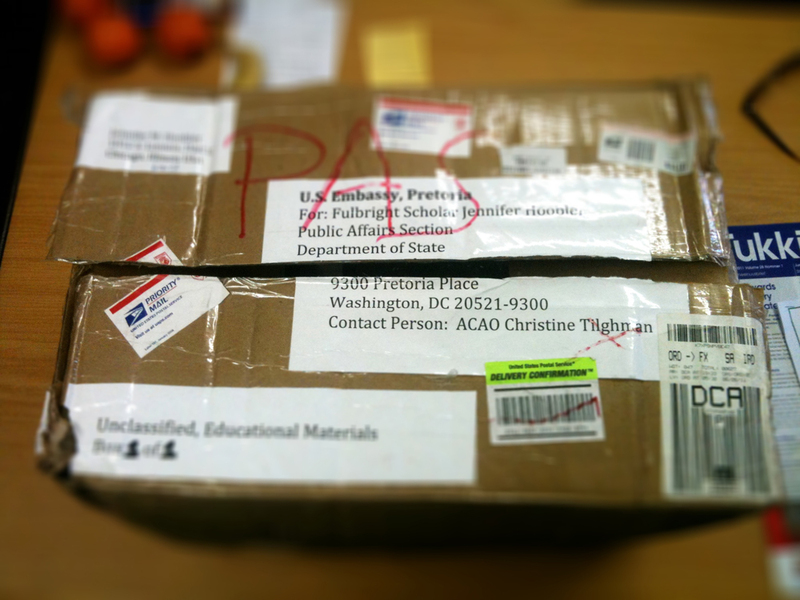 By some small miracle, a box of books and other educational materials we shipped on June 25 finally arrived yesterday. 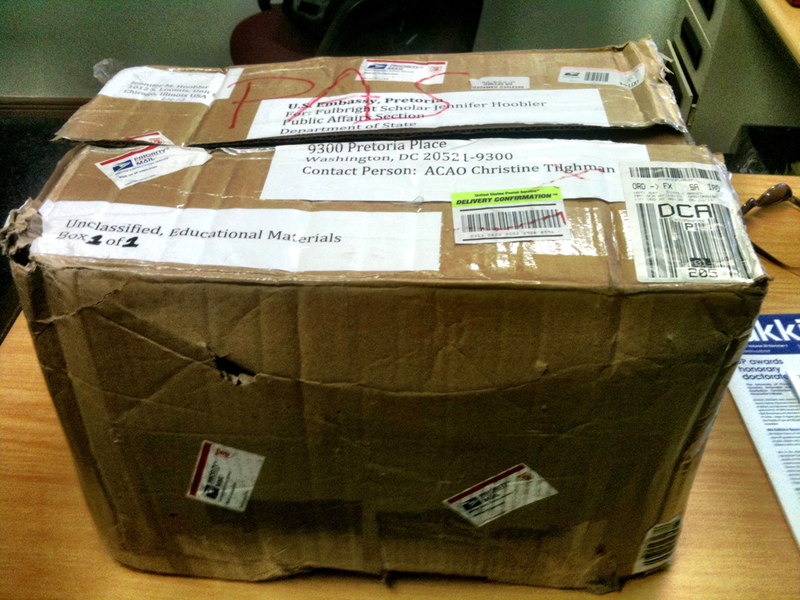 It’s not a miracle that a parcel was successfully sent from a major American city to a world capital city…it’s a miracle that the box survived the journey. As a Fulbright scholar, the U.S. Embassy afforded Jenny the opportunity to send 4 boxes through Diplomatic Pouch service, which meant that we could ship certain items all the way to Pretoria by simply sending them to Washington, DC. The State Department would then forward the items to the U.S. Embassy in Pretoria free of charge. We were warned that it would be a “difficult trip” for any boxes we shipped, so we selected a strong, new book box, packed it carefully and taped it like a grandmother would a birthday present (does she really need to make it that hard to get to a savings bond?). Even after all of that, the box barely survived. Still, for those of who who have threatened offered to stuff yourselves in a box so that you can be shipped to South Africa for a visit, I would not recommend Diplomatic Pouch as a means of travel. You will actually get slightly more leg room and marginally better treatment on United Airlines. And much better treatment on South African Airways*. No pressure. If you’d just like to send us email or ideas for blog posts or someecards, that’s cool, too. *This marks the second time I’ve linked to SAA, by the way, so one of you needs to click and make a reservation.